Created through a "student-tested, faculty-approved" review process with students and faculty, MM4 is an engaging and accessible solution to accommodate the diverse lifestyles of today's learners at a value-based price. MM4 employs an integrated marketing management framework using new and proven learning features to detail key concepts, and useful exhibits and graphics further describe key principles. This engaging book incorporates the latest statistics as well as new coverage that highlights the importance of social media and the impact of consumer behavior on successful marketing management. A complete set of accompanying cases align best-selling business cases from leading case providers, such Harvard Business School Publishing, with specific MM4 chapters. 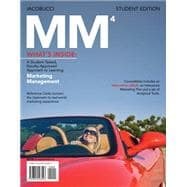 Trust the unique MM4 comprehensive content and complete resources to help students better understanding and apply marketing management for business success.